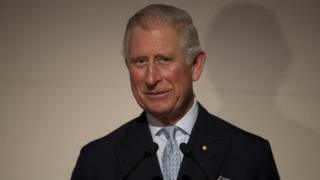 The Prince of Wales has said climate change may have been a factor in the emergence of civil war in Syria. Prince Charles said he was one of those who warned many years ago that there would be rising conflict over scarce resources if the issue was not tackled. In Syria, the prince said, a drought lasting several years meant that many people were forced off the land. His comments come in a television interview to be shown on Monday evening but recorded before the Paris attacks. Prince Charles told Sky News: "We're seeing a classic case of not dealing with the problem because, it sounds awful to say, but some of us were saying 20 something years ago that if we didn't tackle these issues you would see ever greater conflict over scarce resources and ever greater difficulties over drought, and the accumulating effect of climate change, which means that people have to move. "And there's very good evidence indeed that one of the major reasons for this horror in Syria, funnily enough, was a drought that lasted for about five or six years, which meant that huge numbers of people in the end had to leave the land." Asked if there was a direct link between climate change, conflict and terrorism, he added: "It's only in the last few years that the Pentagon have actually started to pay attention to this. It has a huge impact on what is happening. "The difficulty is sometimes to get this point across - that if we just leave it and say, well there are obviously lots of, there are endless problems arising all over the place therefore we deal with them in a short-term way, we never deal with the underlying root cause which regrettably is what we're doing to our natural environment." Prince Charles will travel to Paris next week to deliver a keynote speech at the opening of the COP21 United Nations climate change conference. The summit will attempt to reach a new international agreement to help limit global warming to no more than two degrees. Asked in the interview whether the world could afford to deal with climate change at a time of austerity, the prince said: "The trouble is if we don't, this is the awful thing, if we don't it's going to get so much worse, then life will become very, very complicated indeed, and what we're experiencing now will be as nothing to the problems. "I mean the difficulties in 2008 with the financial crash - that was a banking crisis. "But we're now facing a real possibility of nature's bank going bust. If you see it like that, we've been putting so much pressure on the natural systems and all those aspects of nature that we take for granted."